PHOENIX – State Representative Steve Montenegro today announced that the Honorable Ken Blackwell had endorsed him for Secretary of State. “The job of Secretary of State calls for someone with integrity and backbone. The voters of Arizona would be very well served by Steve Montenegro, a proven conservative, and I wholeheartedly endorse him and support him.” wrote Blackwell in his endorsement. “It is humbling to receive such kind words from such a great leader in our party.” said Montenegro in response. Ken Blackwell served as Ohio’s Secretary of State from 1999-2007 and was the first African-American to be the candidate for Governor from a major party in Ohio when he was the GOP nominee in 2006. He continues to be a major leader in conservative efforts and is currently on the board of the National Rifle Association, the National Taxpayers Union and The Club for Growth. He is also the National Chairman at Pass the Balanced Budget Amendment. In March of this year, and in response to the urging of nearly two dozen conservative leaders from around the state, Montenegro formed an Exploratory Committee to consider a run for Secretary of State. For those who live in the West Valley, please support Sophia Johnson for the Arizona Legislature in district 19! The URAPC referendum application was accepted by the Secretary of State’s office on June 25th at 1:28 pm. The Secretary of State’s office issued referendum number, R-01-2014, which is on the bottom of every URAPC petition making URAPC the valid committee and ours the only valid petition to refer the Medicaid expansion and the associated bed tax to the 2014 ballot for a People’s Veto. The issuance of the number is the Secretary of State’s statement that the petition was accepted. That is the job of the Secretary of State’s office. They are hoping you will not read the lengthy legalize and instead be confused by semantics and insinuation by one of their high priced “legal guns.” If lawyers knew everything we wouldn’t need judges and juries now would we? For the record, the URAPC attorneys reviewed the letter and found it laughable. URAPC attorneys will do their work in the courtroom and will not participate in the political circus of propaganda, chicanery and deceit led by the Governor and her team at Restoring Arizona. The Governors Team is free to continue their “pen pal” relationship with the Secretary of State. While they do that, URAPC will continue to gather signatures. While URAPC appreciates the concern for our volunteers in the summer heat, we would like to note that just a few weeks ago they predicted we would be unable to find volunteers due to the 100 degree temperatures. Instead they now find themselves faced with a clipboard and pen equipped army at malls, restaurants, and shopping centers across the entire state of Arizona. Our opposition attempted to deceive the public with a “fake” petition drive but failed. They couldn’t find enough people willing to take their money to gather signatures and convince the citizens of this state to help the health care industry become the largest corporate welfare recipient in history. The letter from the Governor’s Team is just another failed attempt to confuse and discourage our volunteers; this is just the beginning. The arrogance is blatant. We may be lowly precinct committeemen, small businessmen, and hard-working taxpayers but we can read the Arizona Constitution which affords us the right to veto legislation. Throughout history when the people stand together they have prevailed against the arrogance of the elite and powerful, from the time of Goliath to the British Crown. To our loyal and hardworking volunteers: Do not be distracted. These attempts are intentionally designed to stall principled conservatives from gathering signatures while you search for answers to erroneous questions. This is just the beginning of a well funded campaign to misinform and confuse, and its right out of the playbook of liberal Chicago style politics. URAPC challenges you to instead help us show the elite, the establishment, and the arrogant, that our voices still matter in Arizona by raising your personal goal by another 200 signatures. If we can submit 200,000 signatures the chances of a court case will dwindle. URAPC would like to request a letter of our own from Ken Bennett, not in the capacity of Secretary of State, but as soon to be gubernatorial candidate. 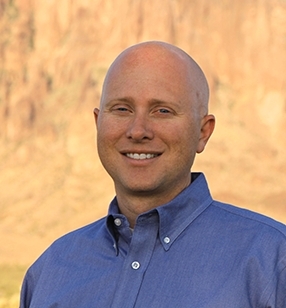 We, the Principled Conservatives of Arizona, would like a letter stating where you stand on the Medicaid Expansion and the implementation of Obamacare in Arizona. We have learned Salt River Project has reached a backroom deal with radical enviros for a partial early shut down of the Navajo Station Generating Station to address so-called visibility issues at the Grand Canyon. The deal will cost a lot of jobs. The secret deal was cut by what they call a Technical Working Group that apparently has been meeting for several months with EPA’s blessing. The Sierra Club did not like the discussion and they publicly stomped out of the room, but the even more radical Environmental Defense Fund stayed in. Seems they are hell bent on force-feeding a job killing deal to Arizona even though a Department of Energy study says there won’t be any visibility benefit at the Grand Canyon from more regulations. That’s because Canyon visibility is impacted by smog and car emissions coming from, you guessed it: California. Just you wait. SRP will try to sell it to Arizona as the only compromise they can get. They will say that the well-funded extremists who are trying to shut them down have forced their hand. The truth is we need to stand up and tell Obama and the radical environmentalists to follow the law and make sure that the plant’s future is talked about in the light of day. We can’t ignore that NGS was a very public deal brokered by Congress decades ago to provide power for Central Arizona Project which pumps water across the state. Last we checked water is still essential to the state’s survival. And with this new “deal” water prices could triple, hurting our economy and families. Most outrageous, is that some think appeasing the liberal activist agenda is more important than taking care of Arizona’s future. Shame on SRP for caving in to these radicals, Arizona deserves better. Submitted by an anonymous conservative activist. Brewer and the Rogue Republicans versus Reagan and the PCs. Recently Governor Jan Brewer sent an email to “Fellow Republicans”. The drumbeat is old. She takes credit for every piece of legislation the conservative super-majority had to drag her kicking and screaming to sign. She continues a litany of the same old tiring message blatantly treating the precinct committeemen like uninformed, low information voters. Bolding words and underlining and underlining and underlining she once again goes on a tirade of how she only wants to help ensure that crony-capitalism rules the day in Arizona completely ignoring the fact that Obamacare in no way fits in the Republican Party platform. Invoking the words of Ronald Reagan she ignores his conservative message along with the message in the resolutions that every legislative district in Arizona, but one, passed. Glaringly absent in the Governor’s repertoire is SB1070. SB1070 is the landmark legislation of Arizona that encompasses our true individualistic spirit and the Governor does not mention it once. State sovereignty exists in the fiber of every Principled Conservative but is lacking in the Governor. She has the audacity to claim that the super majority win in 2010 was due to her one cent sales tax increase, Prop 100, instead of the tireless work of the PC’s fueled by the energy of SB1070! So now she demands we “move on” and attempts to lay guilt on the heads of the PC’s she has tramped all over. Her arrogance would astonish if we had not recently witnessed her suspending the rules and rolling our conservative leaders. Governor Brewer, the 20% carries more weight if it entails throwing someone under the bus. John Parker, Battle of Lexington, 1775. Governor Brewer – you fired the first shot. The PC’s pleas to not fire fell on deaf ears. It is indeed time for you and your band of rogue republicans to “move on”. Mesa, AZ – Trevor Hansen, Candidate for Mesa City Council in District 6 made another significant stride in his campaign today. He received the endorsement of Lisa Anderson; CEO of Mesa Historical Society and resident of district 6. Trevor Hansen has lived in Arizona since childhood and attended Dobson High school. He has lived in Mesa for nearly two decades, and is an experienced strategic marketing and product development manager. He is currently the Director of Product Marketing for Thomas Reprographics. Trevor and his wife Wendy have six children. (MESA, Ariz.) An increasingly influential public interest group, Arizona Public Integrity Alliance (AZPIA), has filed suit in Maricopa County Superior Court alleging that Betsey Bayless has or is about to illegally give away $10 million of Maricopa County taxpayer funds to a private entity. Bayless is the CEO of the Maricopa County Special Health Care District (District), which does business under the name Maricopa Integrated Health Systems (MIHS). AZPIA has had success impacting local politics and public policy and is now challenging Bayless’ misconduct. The District infamously spiked Bayless’ salary last New Year’s Eve, from $375,000 to half a million dollars. The spike occurred despite her pending retirement, drawing the ire of media and taxpayers alike. “The New Year’s Eve salary spike was outrageous, but not illegal. However, the subsequent activities by MIHS to flagrantly disregard its voter-approved mission and invest $10 million to displace an award-winning private sector provider of behavioral health services was the last straw,” said Pace Ellsworth with AZPIA. In its bid proposal for the three-year contract to serve as the Regional Behavioral Health Authority (RBHA) for Geographic Service Area 6 which includes Maricopa and parts of Pinal County, MIHS promised $10 million for its joint venture with Southwest Catholic Healthcare Network (d/b/a Mercy Care), to form and fund the entity called Mercy Maricopa Integrated Care (MMIC). “Taxpayers authorized the District to provide certain services within Maricopa County. This isn’t one of them,” Ellsworth said. Furthermore, the District is actually proposing to use Maricopa County Taxpayer funds to serve parts of Pinal County. “Maricopa County voters would never have taxed themselves knowing of these plans and abuses. And they won’t pass further support for the District if they insist on proceeding,” Ellsworth said. AZPIA attorney, Chris LaVoy, said this is a plain violation of Arizona law and a serious misuse of taxpayer funds. “We are not only going to pursue this legal action, but we are considering recall actions against each of the voter-installed members of the District board who never told voters about this money grab. Between the ridiculous raise provided the CEO and now this, we think voters will revolt against the very people who empowered these abuses,” Ellsworth said. For a copy of the lawsuit filed by Chris LaVoy of Tiffany & Bosco, please contact Michael Scerbo. For more information or to make a contribution please go to www.azpia.org or visit them on Facebook. Please join the Arizona Chapter of Americans for Prosperity as we kick off our statewide summer tour, Preparing for Obamacare, on Wednesday, July 24th in Flagstaff! Northern Arizona University College Republicans will host this special event on the campus of NAU at the Cline Library Assemby Hall beginning at 6 PM. 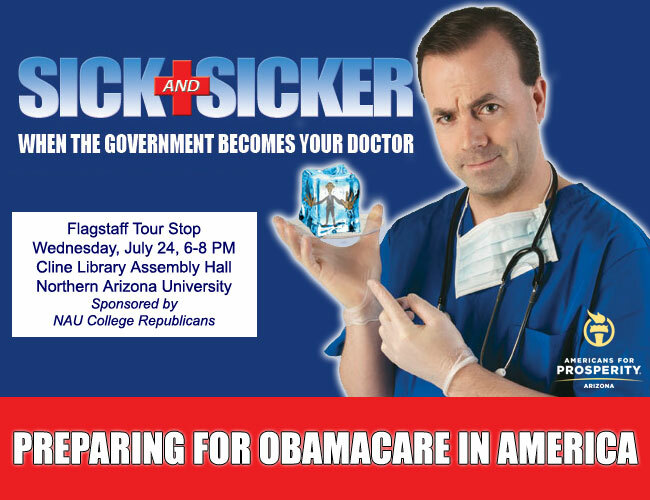 This tour stop will feature a viewing of the documentary Sick and Sicker followed by a discussion with a physician and public policy expert on Obamacare. This is your opportunity to learn what to expect and how to prepare yourself and your family for the implementation of Obamacare. The event is unpriced (free) and open to the public but seating is limited. We encourage you to mark your calendar, make your reservations and bring a family member or friend to the event! Jim Sharpe: Why is crooked Bar Disciplinary Judge O’Neil being protected? ABOVE THE LAW: No judge or attorney will dare take O’Neil on, since he has the power to take their license to practice law away. We learned that judges are above the law when it came to the Andrew Thomas deal, but it goes beyond that. It’s the job of William O’Neil, bar disciplinary judge, to determine whether lawyers keep or lose their license. He sits on a 3-member panel, which is made up of an attorney from the State Bar, and a public citizen. They took away Andrew Thomas’s license. They never looked at the allegations Thomas had brought against public officials, even though the grand juries found them valid. They claimed that Thomas just didn’t like the way the judges were ruling. There’s been some interesting goings on over the past few years with Judge O’Neil. There is a former friend of O’Neil’s who is trying to get the information out there. The story is convoluted, which benefits the wrongdoers. The average person doesn’t pay attention and the wrongdoers keep going. There’s an attorney named Christopher Perry who hit an elderly couple while driving drunk, killing the woman, and he fled the scene. He was indicted by a grand jury, and was sentenced to only a year and a half in prison. Perry’s name appears on about 1,600 documents as an attorney- all while he was behind bars! If you or I had done what he did, we’d probably be doing 7 years behind bars. He served only a little over a year. You’d think his law license would have been taken away. But it wasn’t. This goes back to Judge O’Neil. He issued an order of stay on the suspension. People have been asking to see these orders, but they’re not being produced. Perry held the loan on O’Neil’s mother-in-law’s home. That house was sold in a short sale in 2010, and purchased by a business partner of O’Neil’s, who then turned around and transferred a 50% interest to the judge! You or I have a short sale, we move out of the house, we lose the house. Well O’Neil’s mother-in-law has continued living in the house the entire time! I have a string of emails here, there is an attorney who had her license taken away by Judge O’Neil, who tried to ask for these documents, but she was told they’re not part of Perry’s file! I have been contacted by someone from the State Bar. Why does this private organization get to decide who gets to keep their law license? They’re a bunch of liberals who don’t like people like Andrew Thomas. Whereas people who kill little old ladies get to continue practicing law! The Arizona Supreme Court can pass along the authority to manage attorneys’ law licenses to anyone they want. They need to oversee this and make sure the right thing is done. No lawyer wants to jump into this, because the judge they’re going after could take away their law license! That’s what happened to Andrew Thomas. If you try to go after anyone in power who has control over your law license, they will take you out. I don’t know why the governor’s office isn’t all over this. It’s starting to become clear that they’re preventing folks from putting the documents all together to stop them from figuring it all out. Come on, produce the documents that have been requested. People are trying to protect a judge that should not be protected. Enough is enough is enough. These people are supposed to be unbiased and judging cases. Put some confidence back in the legal system. Listen to the show here, it’s the first 10 minutes. We recommend concerned people contact your legislators about this situation, because clearly the State Bar and Arizona Supreme Court aren’t going to do anything on their own. Phoenix, AZ – Small business owners in Arizona welcomed a study conducted by economist Art Laffer and Donna Arduin that shows closing the online sales tax loophole has a myriad of benefits, including the potential to lower overall tax rates and jumpstart economic growth. Laffer’s study suggests that passing e-fairness legislation like the Marketplace Fairness Act would create a tax system with fewer loopholes, a larger base, and lower rates for all taxpayers, which could lead to an increase in GDP of $563.2 billion and over 1.5 million jobs over the next 10 years. 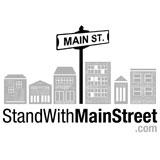 The Marketplace Fairness Act received a bipartisan vote in the U.S. Senate on May 6, 2013, and similar legislation is already pending in the House of Representatives with over 60 bipartisan cosponsors. Dr. Laffer’s findings support the efforts of a growing coalition of small business owners, governors and free market conservatives across the country who are urging the U.S. House of Representatives to act and to pass the Marketplace Fairness Act. “The Laffer study shows we have a chance to not only correct the inequity of the current system, but also to boost economic growth by cutting taxes across the board” said Jim Mapstead of Accurate Signs & Engraving of Phoenix.